You must be crazy. Two hours? Wow. *whistles* This is insanely detailed. Yeah...the animation is kinda slow. but you take your time, and thats what counts...good job! this has to be your best here at 2draw... awesome sh!zn47! 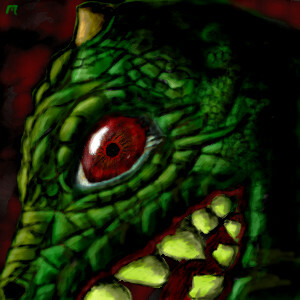 The teeth are a bit unfinished lookin...but I like this critter.. the skin is great ..good details and I LOVE that eye!